The right bike gear at the right time. When you are learning to use your gears you have to consider so many things all at the same time. You are approaching a hill and you know you need to make it easier to pedal otherwise you will not make it up the hill. But which lever and when do you change? Does this sound or feel familiar? Coordinating all the things involved in changing gears is challenging and it takes time to pull it all together. Practise, patience and perseverance and you will find your riding smile. In this story we are going to consider what is the right gear and when is the right time to be in that gear? Our previous stories on bike gears will help support you with your Understanding of bike gears and How to use your bike shifters to change gears, so you know how to get into the right bike gear. When to use a LOW gear: going up a hill or into the wind you will want to be in a low gear. Remember low = easier to pedal. You’ll be able to climb the hill or take on that wind slowly and steadily with less effort. Remember gears allow you to pedal comfortably no matter what the terrain or the conditons. Find the right low gear that allows you to pedal comfortably, that allows you to maintain a comfortable rate for the environment and conditions you are in. 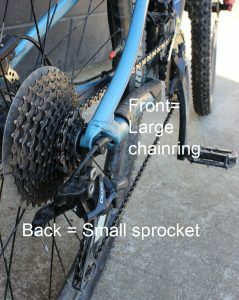 Back = Large sprockets. The number of sprockets on your rear cassette will vary depending on how may speeds/gears your bike has. 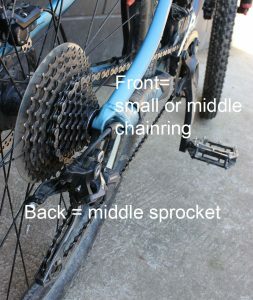 You will be in a low gear if your chain is on the larger sprockets. When to change into a low gear: Switch down to this gear combination as you approach the climb. When in doubt, shift before the terrain changes. If you are pushing hard on your pedals when you are about to change, ease up on the pedals, as the chain may skip or fall off. When to use a MIDDLE gear: riding on relatively flat terrain you will want to be in a “middle gear”. Remember gears allow you to pedal comfortably no matter what the terrain or the conditons. Find the right middle gear that allows you to pedal comfortably, that allows you to maintain a comfortable rate for the environment and conditions you are in. Front = Small chain ring if you have 2 chain rings. Middle chain ring if you have 3 chain rings. Back = The middle sprockets. The number of sprockets on your rear cassette will vary depending on how may speeds/gears your bike has. You will be in a middle gear if your chain is on the middle sprockets. When to change into a middle gear: There is more flexibility of when to change into the right gear on flat terrain. Let your guide be your pedal comfort – change to find that comfortable pedaling rate. If you are pushing hard on your pedals when you are about to change, ease up on the pedals, as the chain may skip or fall off. When to use a HIGH gear: Riding down a hill you will want to be in a high gear. Remember high = harder to pedal. Being in a high gear will stop your legs spinning out of control. In a high gear, you travel a long way for each turn of the pedal. Remember gears allow you to pedal comfortably no matter what the terrain or the conditons. Find the right low gear that allows you to pedal comfortably, that allows you to maintain a comfortable rate for the environment and conditions you are in. When to change into a high gear: Switch up to this gear combination before you start to descend, before your legs start to spin out of control if you are required to pedal. If you are pushing hard on your pedals when you are about to change, ease up on the pedals, as the chain may skip or fall off. Note: There are a couple of gear combinations that you may want to avoid as it can put too much strain on the components of your bike. Basically it is when the chain is on its largest possible angle. Your gearing on your bike will determine whether this is an issue or not. You will know as the chain just looks strained in this position. 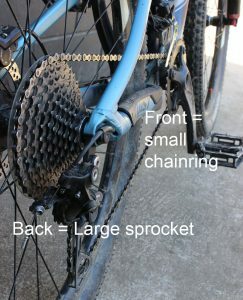 Example One; Front small chain ring, back small sprocket. Example Two; Front large chain ring, back large sprocket. Now you have the information, the best way to learn is to practise on your bike. Pick a safe area that has some changing terrain and give it a go. Understanding how to use your bike gears will provide you with the ability to go places you might not have thought you were capable of. To get more understanding of bike gears read our other stories on bike gears so you can goRide more places, more often with a smile.